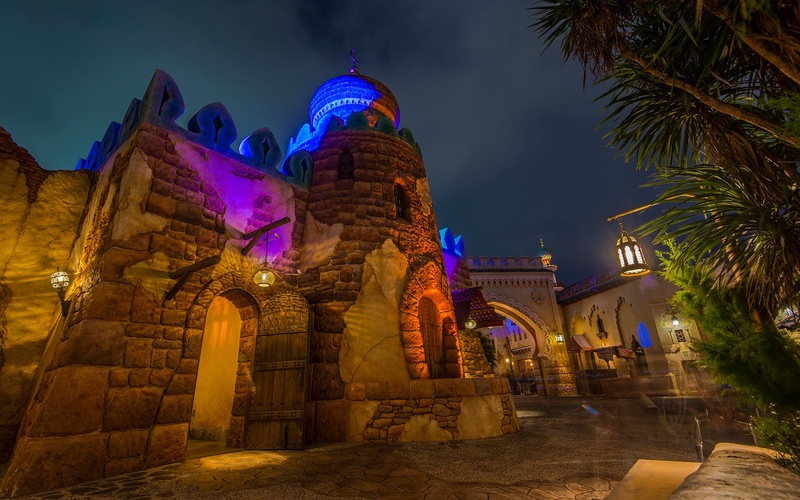 The one regret I have from my two trips to Tokyo Disney Sea is not getting enough empty park nighttime photos from the Arabian Coast area. I had a decent run on my first ever night there, then never really returned, choosing to concentrate on other lands instead. I wish I had come back, though, because there are so many nooks and crannies to the Arabian Coast that a dozen or two photos don't really cover the evocative ambiance of this land. In the absence of more photos, I'll have to make do with the few I have, like this scene just past the entrance to the Sinbad's Storybook Voyage. The buildings in the Arabian Coast brim with an exotic sense of charm. Thank you so much for your excellent job! Love the pictures. Thanks for the complimentary comments! Glad you enjoy them!